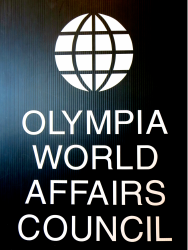 ﻿The Olympia World Affairs Council's program year runs September through April. Speakers include professors, economists, diplomats, historians, scientists, non-profit organization leaders, business executives, and public officials. Each December, instead of a speaker, we meet for small group discussions on several topics led by informed members (this event may be moved to the second Thursday to avoid conflicting with the holidays). ​In May we host the OWAC Spring Reception, which is centered around the presentation of the Global Connect Award. In addition to our September-April regular schedule, we occasionally offer special programs, social gatherings with discussions of timely topics, and one-time summer programs. Schedule Changes: In the event of late-breaking changes, we will endeavor to update this page and our Facebook page ASAP.